Grand Central Terminal in New York City was built in 1913 and is the largest train station in the world, complete with a rich history—including the demolition of the first structure built in 1871—and plenty of secrets. If you're traveling to NYC, consider exploring the hidden corners, the shady past, and the many quirks of this famous landmark. 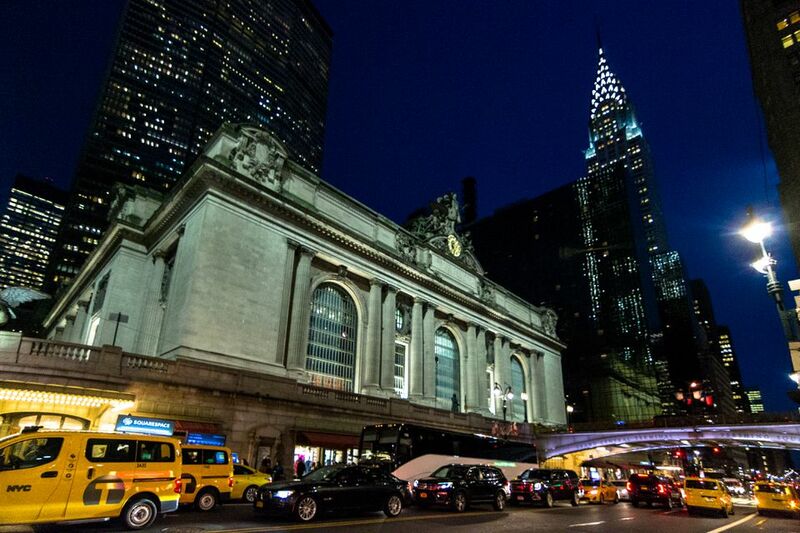 From a whispering gallery to secret passages and tunnels, a kissing room to a secret hidden in plain sight, discover all there is to see in Grand Central Terminal on your next trip to New York City. Simply visiting this staple is worth the trip; fortunately, if you're traveling by train into the city on the Metro North Railroad, it's likely you'll pass through the renowned terminal first. The many secrets of Grand Central Terminal can provide hours of entertainment if you are stuck waiting on the next train. Anchoring midtown Manhattan at 42nd Street and Park Avenue, Grand Central is in the middle of New York City, on enough bus lines and subway routes that you'll probably pass it at some point during your stay if you travel up the east side of the island. The "whispering gallery" or "whispering wall" is located on the Grand Central Terminal dining concourse near the famous Oyster Bar & Restaurant. Here, the acoustics of the low ceramic arches can cause a whisper to sound like a shout. To test it out, you and a friend will have to stand in opposite corners of the large arched entryway, then face the corner and whisper. Your friend should be able to hear your voice as if you were right next to them, not whispering into a faraway corner. According to experts, this happens because the whisperer’s voice follows the curve of the domed ceiling. The Whispering Gallery is a popular spot for marriage proposals—and a unique place to quietly share sweet nothings with your main squeeze. Underneath Grand Central Terminal, there are secret networks of underground tracks, steam-pipe tunnels, and storage areas. Hidden in these depths is a train platform with an undercover entrance and an elevator straight up to the Waldorf Astoria hotel. President Franklin D. Roosevelt reportedly used this as his private entry into New York City—a way to get from his train to the hotel without being bothered by reporters. Unfortunately, you can’t currently see this behind-the-scenes passage, because the door to the secret elevator is welded shut. The Biltmore Room, located in the Main Concourse near the 45th Street Passage, was known as the “Kissing Room” during the golden age of train travel during the 1930s and 1940s. The famous 20th Century Limited train from the West Coast used to arrive at The Biltmore Room. Passengers on this service—including many celebrities and politicians—would get off the train and greet their loved ones with kisses and hugs. Often, they would go upstairs into the famous building that was then the Biltmore Hotel. The ceiling over the Main Concourse, with its famous mural of the stars, is another one of Grand Central Terminal’s most known features. However, eagle-eyed visitors will notice that the zodiac on the ceiling is depicted backward. Some have speculated that this was a mistake by the artist, Paul Helleu, but according to official documents, the painter was inspired by a medieval manuscript that showed the heavens as they would have been seen from outside the celestial sphere. The famous ceiling has another, more recent, secret. If you look carefully, you will see a patch of dark on the carefully restored blue of the mural. This spot shows the color of the ceiling before restoration, left as a reminder of how much work was done.